(SEATTLE) – SEPTEMBER 23, 2010 — Representing the most current and comprehensive social media usage study yet conducted within the adventure tourism trade sector, the Adventure Travel Trade Association (ATTA), Resmark Systems and Convince & Convert today released, Travel, Tweets & Trends, a report indicating that social media usage among adventure tour operators is pervasive, while its efficacy remains relatively uncertain. 75% of respondents indicate that their budgets (including human resource wages) for social media will increase in the next 12 months. Additionally, survey respondents indicated their primary objectives of social media usage include, in order of priority, generating consumer awareness (83%), connecting with existing customers (70%), connecting with current customers (61%), and sending out special offers (53%). Meanwhile, only 32% of respondents are using social media as a customer service tool, which, according to industry experts, is a missed chance to reduce customer service costs while satisfying customers. Travel, Tweets & Trends offers narrative interpretations of social media usage trends, numerous adventure tourism tour operator case studies, plus prescriptive measures for how the adventure tourism trade can become more effective at using social media to improve business results. The executive summary is available for free, while the complete, 41-page whitepaper is available for purchase ($50) at www.adventuretravel.biz. Commissioned by tour operator software company Resmark Systems and the ATTA, the study was conducted by Convince & Convert, a social media consultancy led by Jay Baer, one of the world’s most accomplished social media experts. Further analysis was provided by the ATTA, Resmark and tourism, digital media and marketing industry professionals. Review board participants included: Kevin Johnson, Deluxe Digital Media; Alexia Nestora, Lasso Communications; Kathy Dragon, TravelDragon; Jason Reckers, Adventure Travel Trade Association; Christina Heyniger, Xola Consulting; and Chris Noble, World Nomads. Established in 1990, the Seattle-based ATTA (www.adventuretravel.biz) is a global membership organization dedicated to unifying, networking, professionalizing, promoting and responsibly growing the adventure travel market. 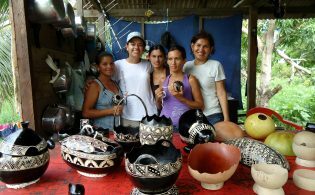 ATTA members include tour operators, destination marketing organizations, tourism boards, specialty travel agents, guides, accommodations, media and service providers. Host of the annual Adventure Travel World Summit executive trade conferences, the ATTA also makes possible www.Adventure.Travel, the traveler’s hub of physical, cultural and nature-based adventure travel and guide to trusted tour operators from around the globe. The ATTA currently uses Facebook, Twitter, LinkedIn, and runs its own social network called “The HUB” via a Ning online community site. Convince & Convert is a social media strategy consultancy that works with corporate clients and public relations firms on maximizing the impact of social media participation. The firm is led by Jay Baer, one of the world’s most popular social media authors and speakers. He is the co-author of the book The Now Revolution, to be published in early 2011 by John Wiley & Sons. Founded in 2005, Resmark Systems offers comprehensive tour operator software created by tour operators with years of experience. Its software is designed to manage all functions of the tour operator business including online reservations, marketing, finances, accounting and comprehensive tracking and reporting. 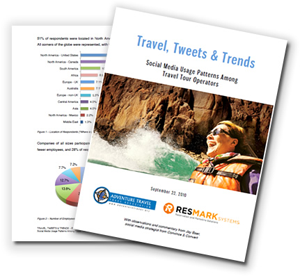 Additionally, Resmark Systems is one of the few specialized solutions dedicated to helping tour operators save time and labor costs by automating social media engagement via email, blogs, Facebook and Twitter.